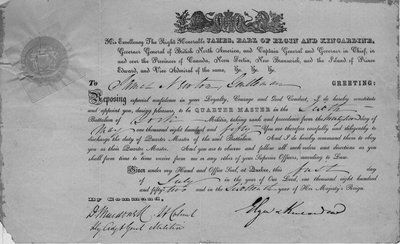 This document, dated at Quebec City, July 1, 1852, authorizing the appointment of James Newton, a resident of the district, as Quarter Master in the 6th Battalion of York Militia, bears the sign of the Earl Elgin and Kinkardine, Governor General of British North America at the time. Lord Elgin held office at a time when one of the stormiest episodes in history of Canada occurred. Angry citizens showed their disapproval of his signing of the Rebellion Losses Bill by burning the Parliament Building at Montreal. It was there decided to move the Parliament, and the next two years it was held in Toronto, then began alternating in Quebec, so this would be the first year the Legislature met in Quebec.